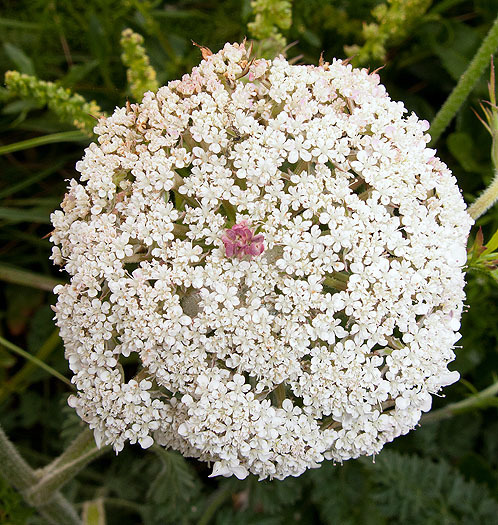 The flower Head of a Wild Carrot plant - "Daucus Carota" , a biennial of fairly infertile, free draining and usually calcareous soils, especially near the sea. A White Umblifer with , as in this photo , a single Red flower in the centre. Also known as Queen Anne's Lace , Fools Parsley , this is a plant with feathery leaves and dainty , lacy flowers. Unlike cultivated carrots, the wild carrot's root is tough and stringy and not particularly palatable. Once flowered the umbel folds inward, clearly showing the three forked bracts , and the developing head of seed becomes concave. The whole structure has a distinctive "bird’s nest" appearance which can be present throughout winter.